You wake up one morning and your bags are packed. You’ve spent the past week putting all of your ‘stressors’ on temporary hold. The emergency projects at work have been explained and put in the hands of someone you trust (more or less… ;-)). Your kids are self-sufficient or they’ve been left in the care of a close family member. Your siblings have committed to keeping a close eye on your aging parents and your best friend is watching the dog. You’ve even tackled your inbox, despite the fact that it meant deleting half your emails without opening them. You tuck that book you’ve been meaning to get to into your luggage. You can feel the tension in your neck and you are so ready to get away. Not so tense anymore. In fact, it’s one of the most beautiful places in the world you can imagine to visit! Last week, I returned from this magical trip and I can tell you for sure, there’s nothing quite like it. From the minute we arrived, I could feel the tension slip away. The extraordinary landscape, the vibrant hues, the perfect climate and the wonderful people, all combined to deliver a relaxed escape in an unmatched location. 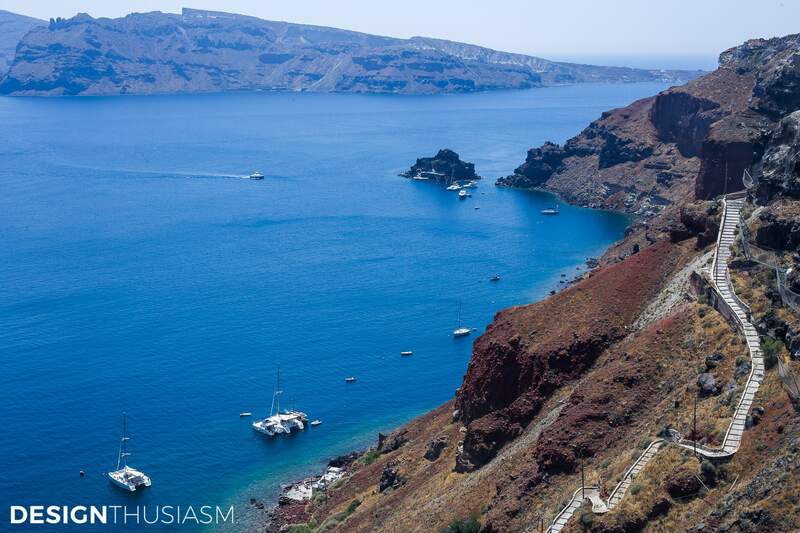 Santorini is an island in Greece that is known for its exceptional terrain. 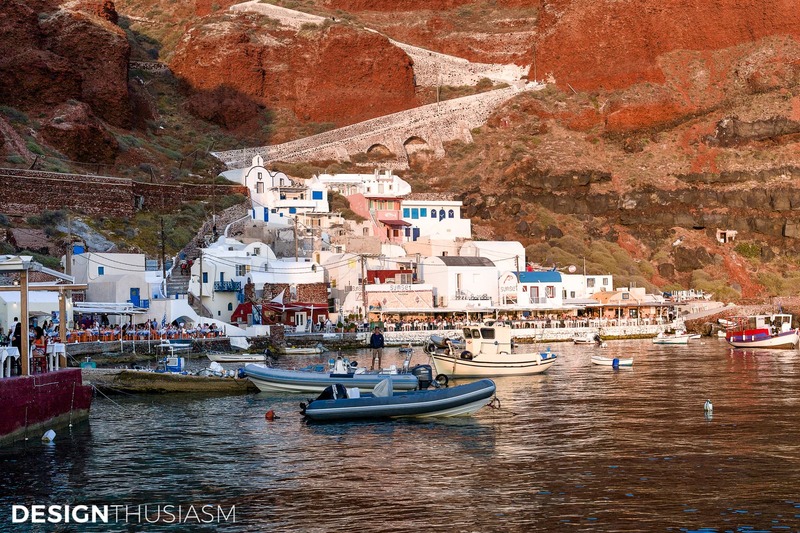 The lovely town of Oia is built into the side of this rocky cliffside, overlooking the caldera, and the hotels and restaurants take full advantage of the gorgeous vistas from this compelling perch. There are stairways leading everywhere and some of them are not for the faint of heart. 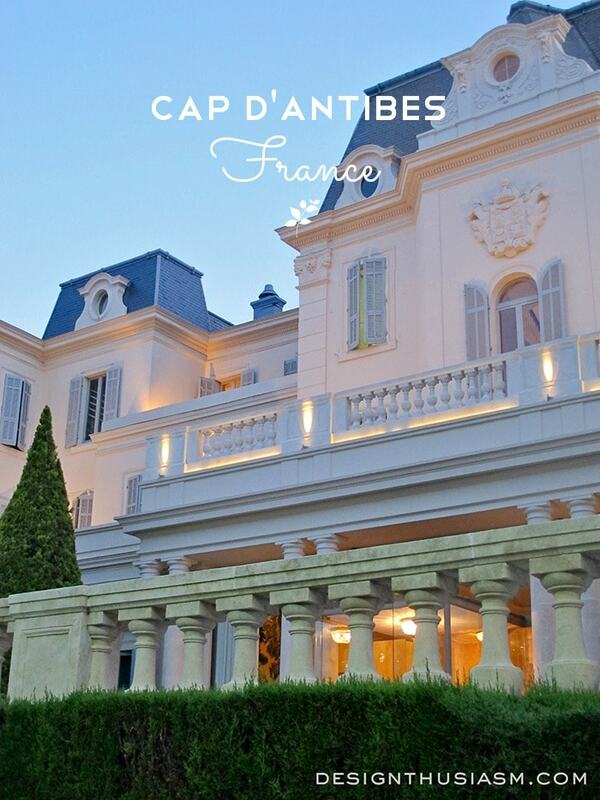 Yet from the minute we were dropped off at our stunning hotel, we knew this place was about relaxing and recharging. We stayed at a hotel called Katikies (see source info below) and the design and service were both top notch. 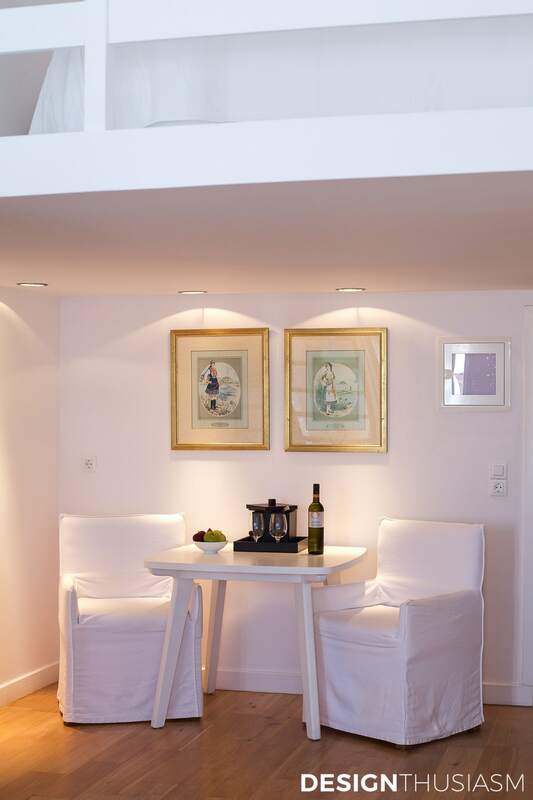 We were fortuitously upgraded to a duplex suite, all presented in crisp clean whites, with a lovely jacuzzi on our private terrace. Waking up in this setting and opening the morning shutters to reveal the magnificent view is something I am certain I would never get tired of. We were lucky to have wonderful weather, so we generally ate our breakfast outdoors, but this pretty little nook would serve just as well. A walk into town revealed enchanting views, from signature blue and white architecture to the ubiquitous fuchsia florals that offered just the right contrast. 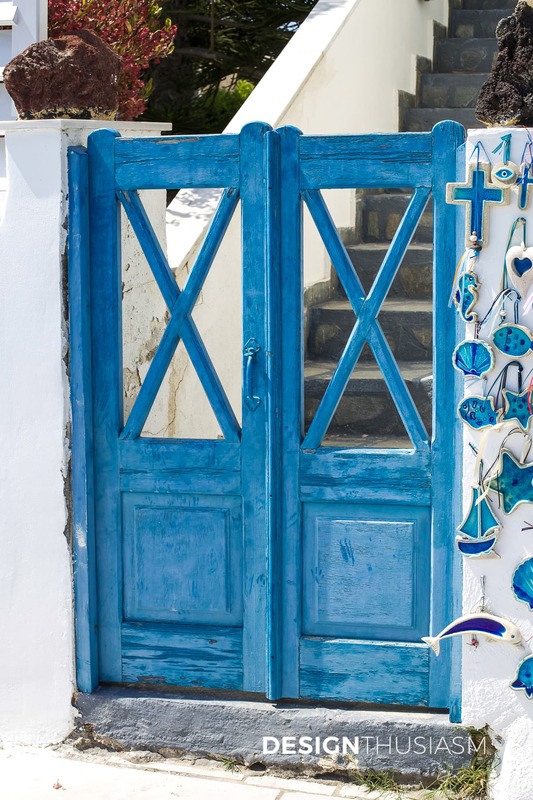 Painted doors and shutters peppered the landscape, with weathered patinas that only enhanced the sun-drenched colors. 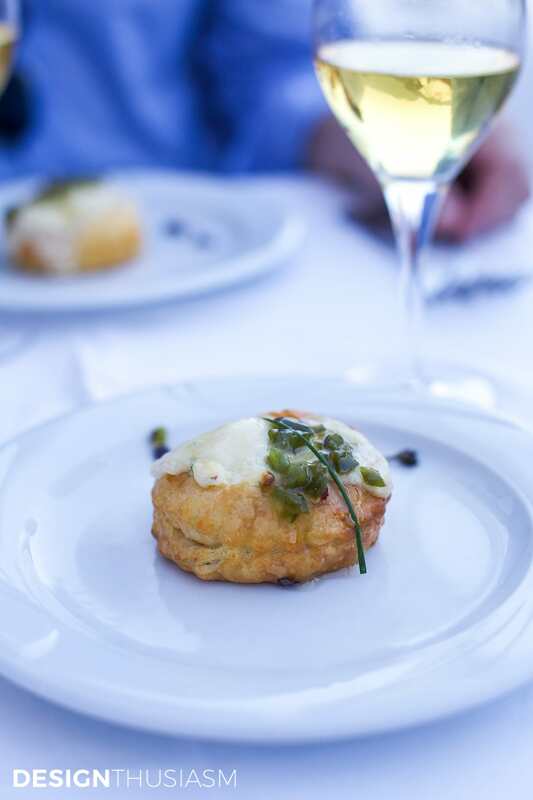 Dinners were often spent chasing the sunset, always al fresco and utterly delightful. 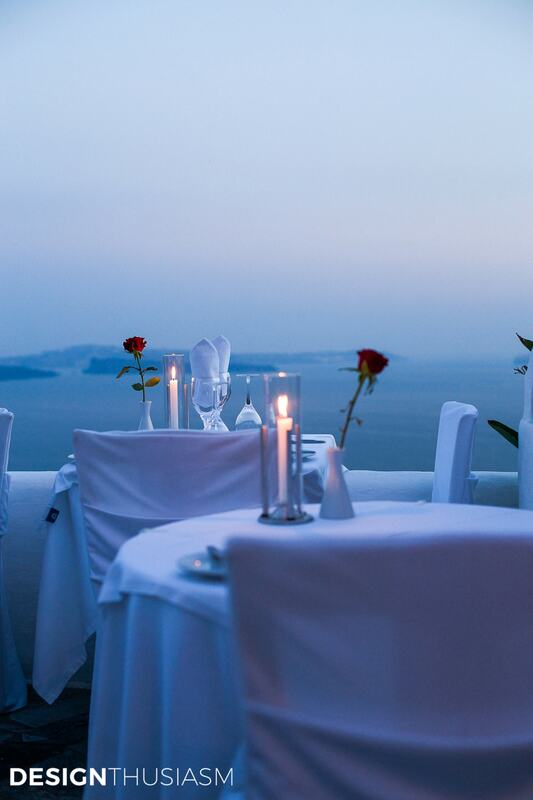 This romantic meal at Ambrosia restaurant was served on an elegant terrace draped in white linens. The food was exceptional and artfully presented. Our second meal involved a short ride down to Amoudi Bay, where we prepared for sunset while the water lapped at our table. The yellow glow of the setting sun provided a striking contrast against the unmistakable blues of the popular bay. Our restaurant was called Sunset, and it’s no surprise where the name came from. 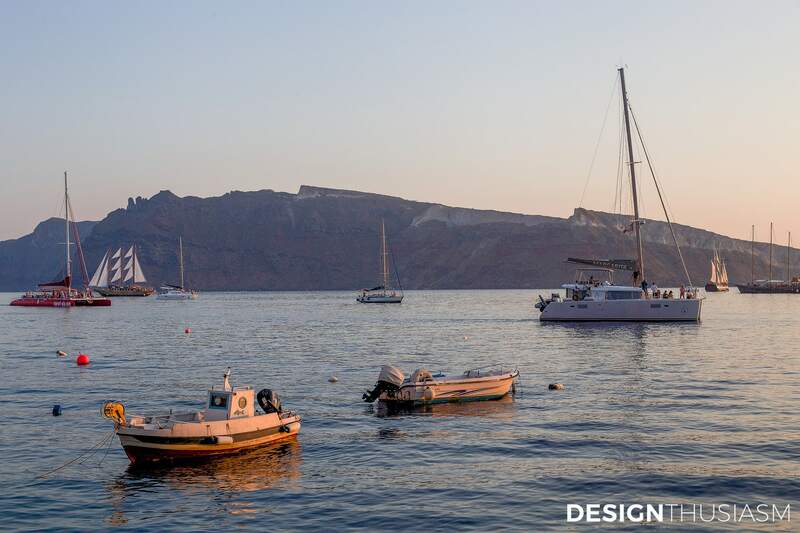 And much like elsewhere in Santorini, the rocky pier that offered a good sunset view became the most popular spot to be as the sun declined. 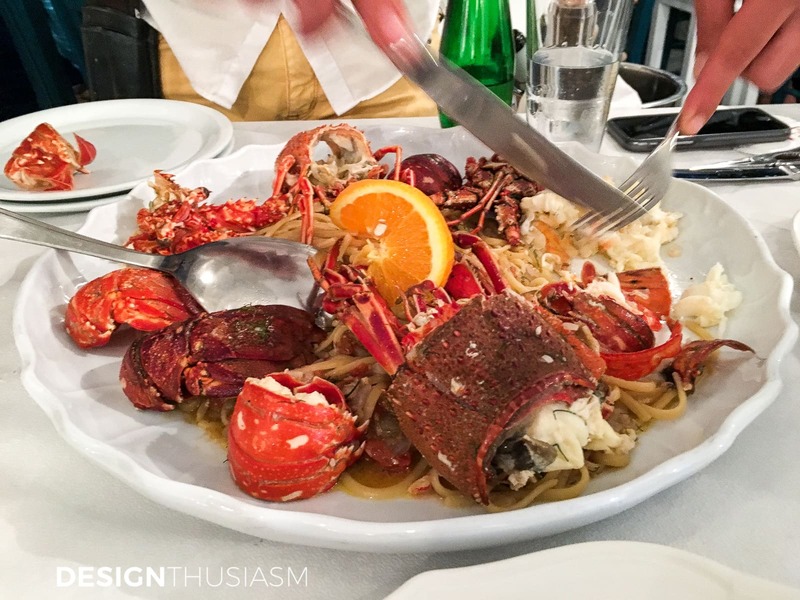 Seafood pasta is the dish de rigueur and it didn’t disappoint. Hint: order one and split it! We like to relax on this type of trip, but there’s plenty to see if you’re willing to explore. 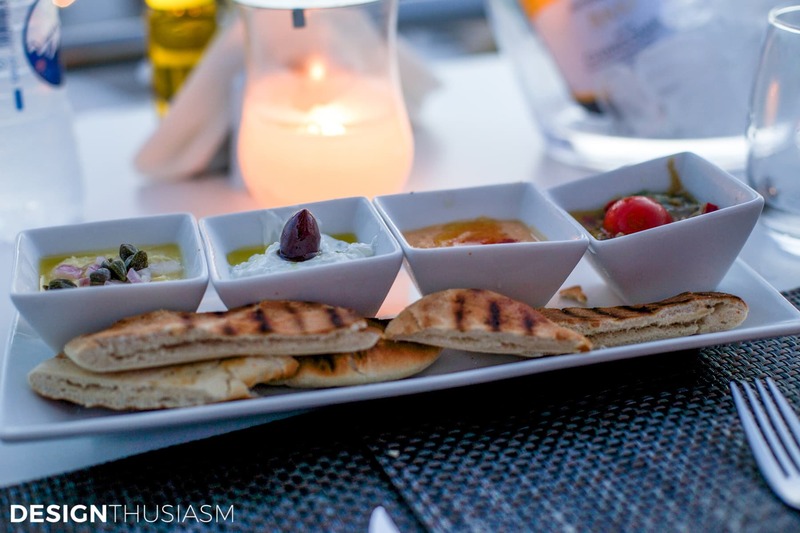 On our last night there, we finally caught an unobstructed view of the sunset at a fabulous restaurant called Strogili. Reserve this place if you want to see the full ‘show’. 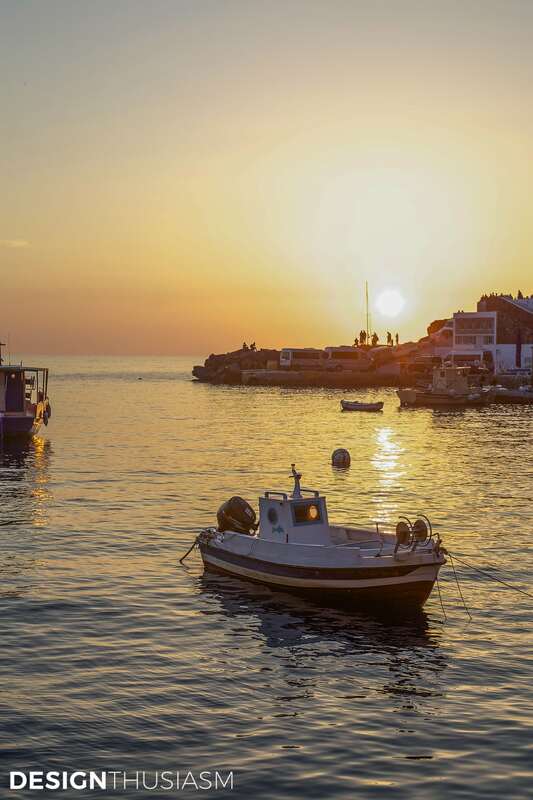 The setting sun casts the entire vista in a glorious palette, replete with blue domed churches and pastel facades, all perfectly fit into this vertical town like puzzle pieces, on the tip of this magical island. Most Beautiful Places Source List: This post contains some affiliate links for your convenience, but these are actual places I visited and loved! Click here to read my full disclosure policy. So happy to see this in my inbox Lory…I’ve been waiting, LOL. What a fantastic trip and wonderful photos! 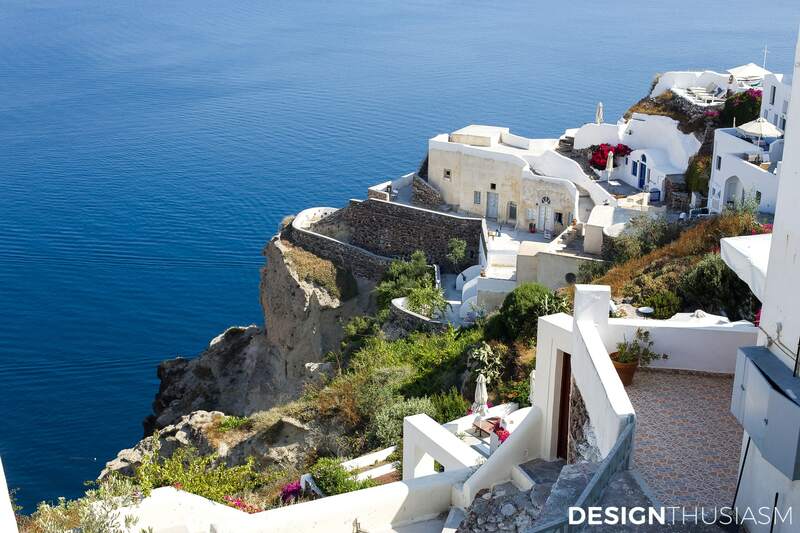 I’ve been to Europe many times but Greece is still on my radar and this is motivating me to head over someday. Oh, Janet, you must! I waited a long time too, but so glad we went. 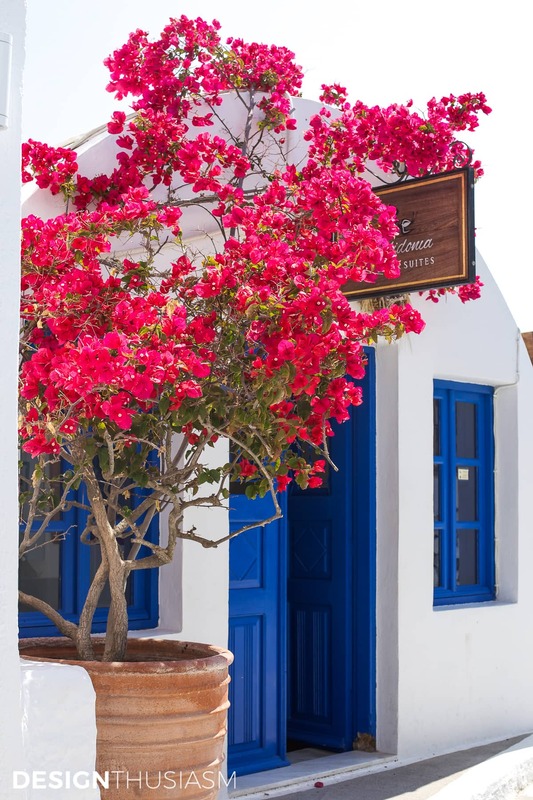 I loved Mykonos too and will post that separately. Very different islands but both wonderful. Now I’d like to see more! Thanks for stopping by!! What an awesome trip. 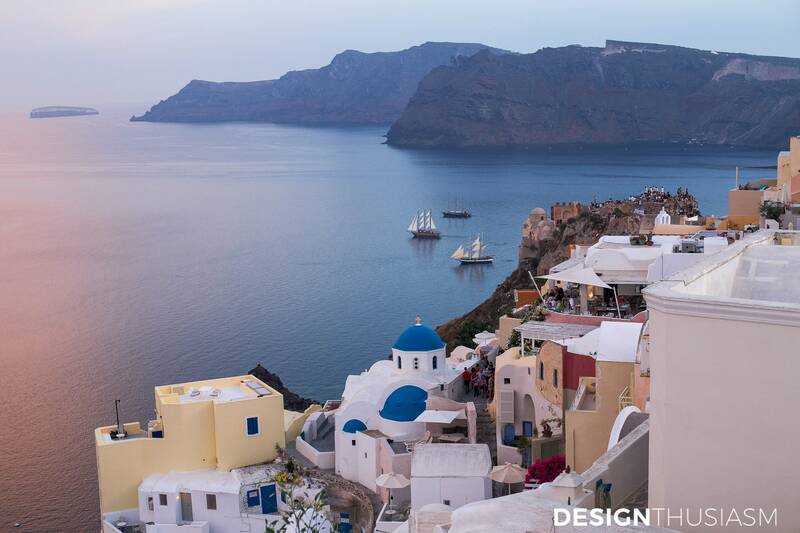 I LOVED Santorini when I was there a few years ago. 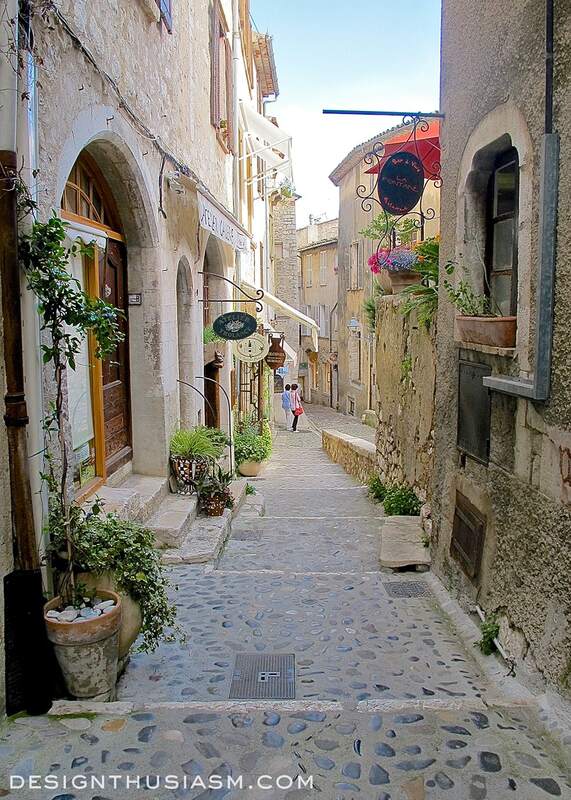 Our Mediterranean cruise was our most favorite. I would go back in a minutes and stay for a month. Nothing can come even close to the beauty here. I so agree and would love to go back on a cruise… 🙂 We made a few other stops which I will post separately because there were just too many photos for one post! Boy, could I ever use a gorgeous trip like that right about now! Felt relaxed just viewing the pictures. Know you had a ball. I was there last Summer. 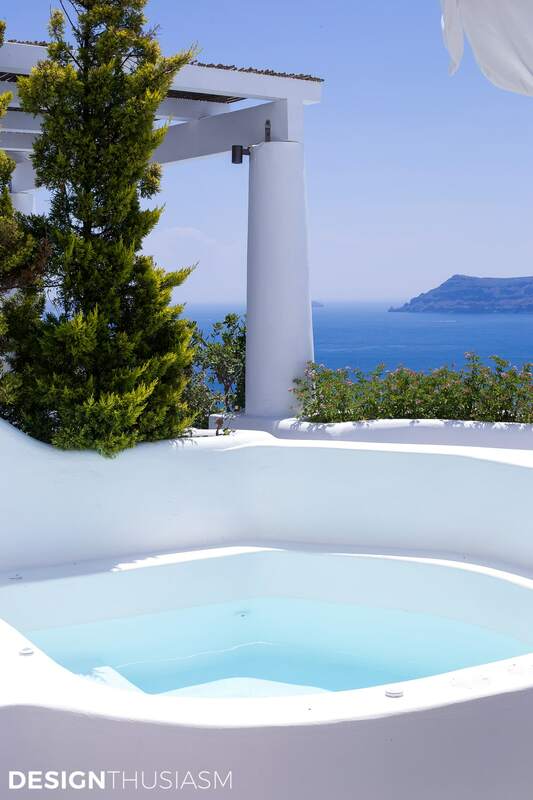 It is a magical place especially when you sit overlooking the caldera. I felt transported to another place and time. 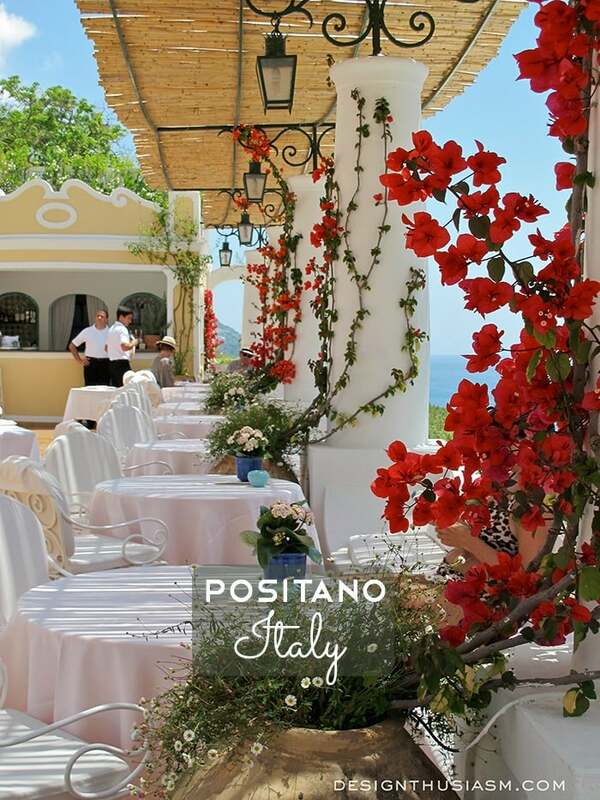 Lory, you shared beautiful photos of one of my favorite places. 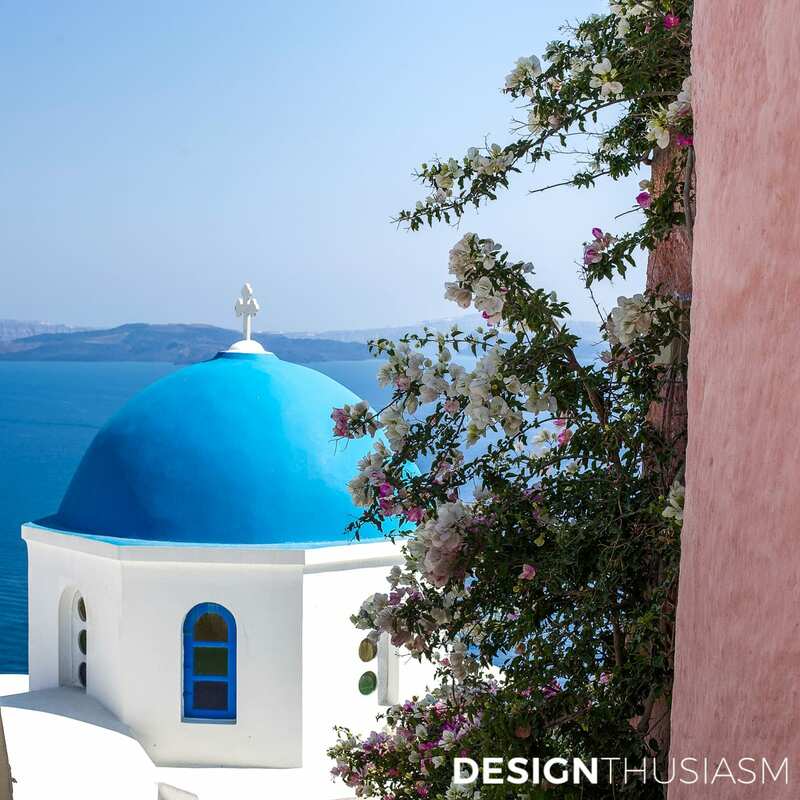 We visited several Greek islands and they were all beautiful! 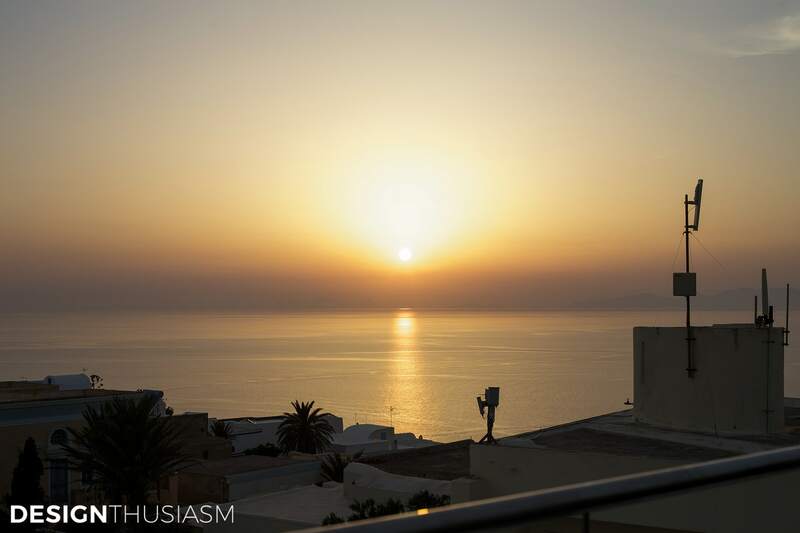 But, Santorini is by far the best! Such gorgeous places and photos, Lory. What an awesome trip. I have been to Athens and did a day cruise to some islands, but it was a short visit along with other stops. 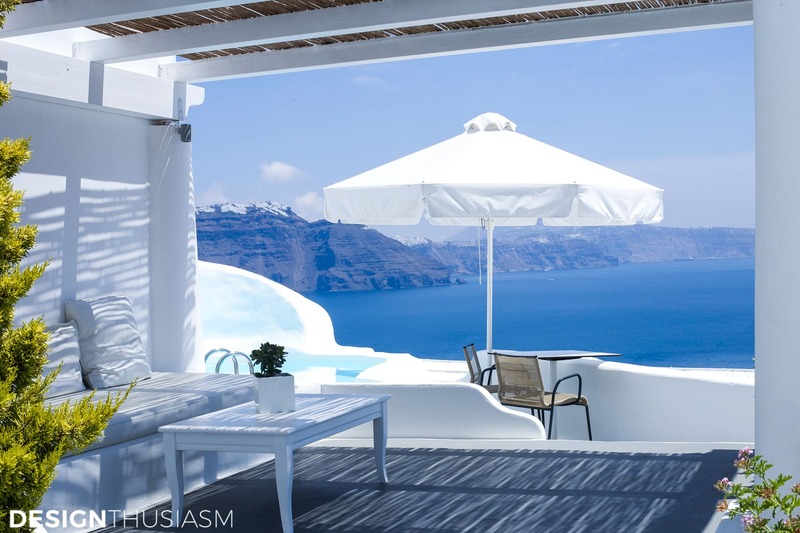 I would love to see Santorini and those beautiful blues. Oh Lory! 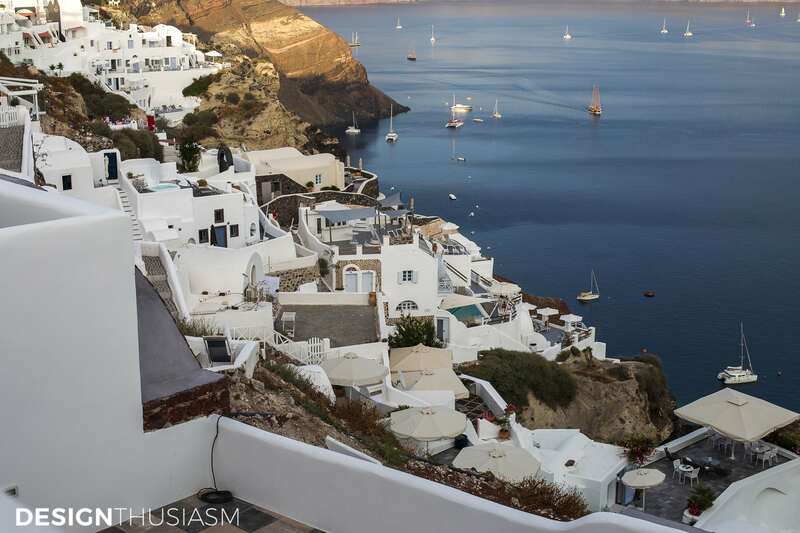 Thank you for sharing – I visited Santorini many right after college. This brought back many memories. Might be time for another visit! Haha, it’s always time for another visit… 😉 But how lucky that you went so young! One of my favorite places we have visited! Funny, I was just looking this morning for info on traveling between the islands. Thanks for sharing your wonderful trip. Lovely photos and so glad got the chance to visit this exquisite part of the world. 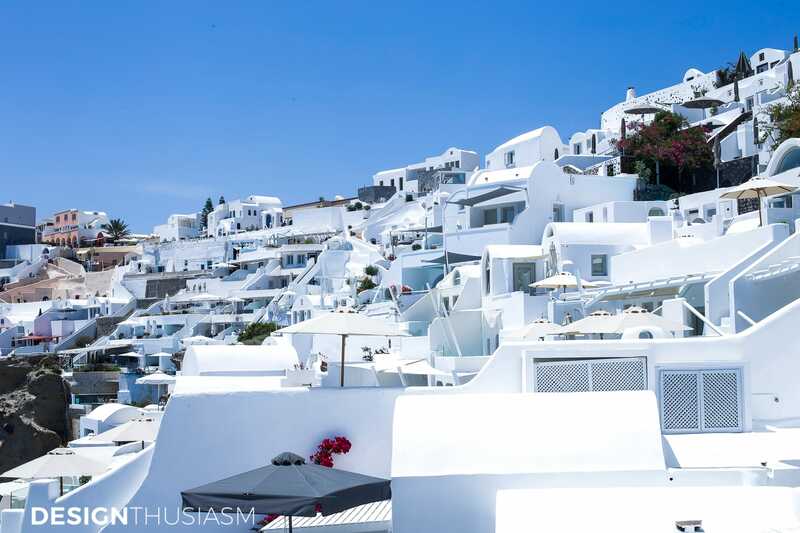 I’ve heard that Greece is going to now limit the number of visitors to Santorini as they feel there’s just too many, so it was good you went when you did.